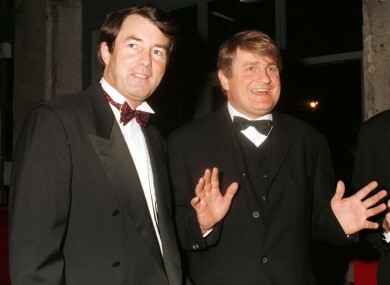 THE FORMER COMMUNICATIONS Minister Michael Lowry and business tycoon Denis O’Brien have welcomed a Supreme Court decision which will allow the two unsuccessful bidders for Ireland’s second mobile phone licence to challenge the State’s decision to grant it to Esat Digifone. In a statement issued this afternoon, the current Independent TD also urged the consortia to “belatedly proceed” with their legal challenge. The Tipperary deputy said that he has “always advocated” that a court of law is the “proper forum to critically probe the process” which led to the licence being granted to Denis O’Brien’s Esat Digifone in 1995. I welcome the fact that 17 years later the Supreme Court is granting them the opportunity to have that decision tested in law…I am happy that the losing consortia’s court challenge will be governed by strict rules of evidence where facts must be established, where the sworn evidence of those who know the facts such as more than 17 civil servants and all others involved in the process will have to be accurately adjudicated on to the exclusion of hearsay and opinion. Lowry concluded that the claims about how the licence was awarded are “without merit or substance” and “should be vigorously defended by the State”. In a similarly worded statement, O’Brien said he is “absolutely satisfied” that the allegations being pursued will be “demonstrated to be devoid of evidence and substance”. He added that he welcomes the opportunity to fully defend all allegations made in relation to the licence competition process. Esat Digifone Limited won “for the very simple reason that it submitted the best bid”, according to O’Brien. Declan Ganley – a businessmen involved in one of the failed bids – said he was “chuffed” with today’s Supreme Court decision. The consortia have argued alleged fraud, conspiracy, deceit, corruption and wrongdoing, in their actions. The circumstances of the awarding of the licence was subject to scrutiny during the nine-year Moriarty Tribunal. In 2001, Comcast International Holdings Incorporated and Persona Digital Telephony Ltd brought actions against the State, Esat Digifone and its chairman Denis O’Brien. In 2007, the High Court stopped the cases because of inordinate and inexcusable delay in prosecuting them. However, lawyers for both consortia argued that they were entitled to wait until the Moriarty Tribunal report before proceeding. The five-judge Supreme Court today allowed the appeals, reports RTÉ News. The Moriarty Report, published in March last year, criticised Lowry’s role in the awarding of the licence to Esat Digifone. Justice Michael Moriarty said that Lowry was far from a disinterested Minister who exerted “insidious and pervasive influence on the process”. In his statement, O’Brien noted that the two damages claims have been advanced by Persona and Ganley – not Comcast. The Digicel owner added that the consortium in which Ganley was involved came last out of six applicants in the competition process. Email “Lowry, O’Brien welcome court ruling allowing challenge to mobile licence decision”. Feedback on “Lowry, O’Brien welcome court ruling allowing challenge to mobile licence decision”.